This was a good book. Now I can tell people what to do. Well, the title of the book does sound a bit manipulative and the author does address that. The technique was developed when he worked in a hospital trying to influence drug addicts to persuade themselves to get off drugs when no other techniques or approaches were effective. Notice I said to"persuade themselves”. 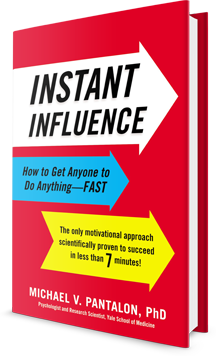 The basis of the Instant Influence technique is to, at all cost, maintain the autonomy of the person being influenced. In the book the author the details the six questions to be asked in and Instant Influence conversation and provides examples of the application and adaptation to different situations and circumstances. How ready are you to change, on a scale from 1-10 where 1 means “not ready at all” and 10 means “totally ready”? The questions may seem to be worded awkwardly, but every word is intentional and there for a good reason.